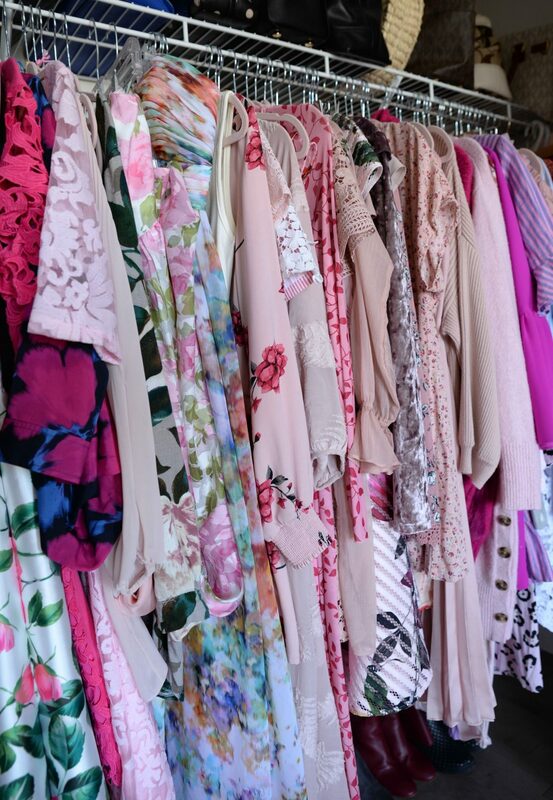 The key to designing and creating your dream closet, is to identify what your wants and needs are. 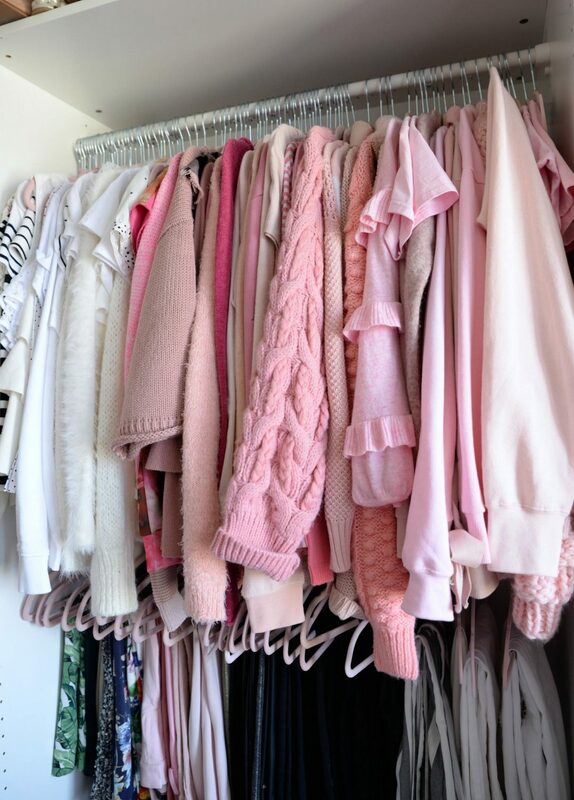 A well functioning closet will serve you for years to come. 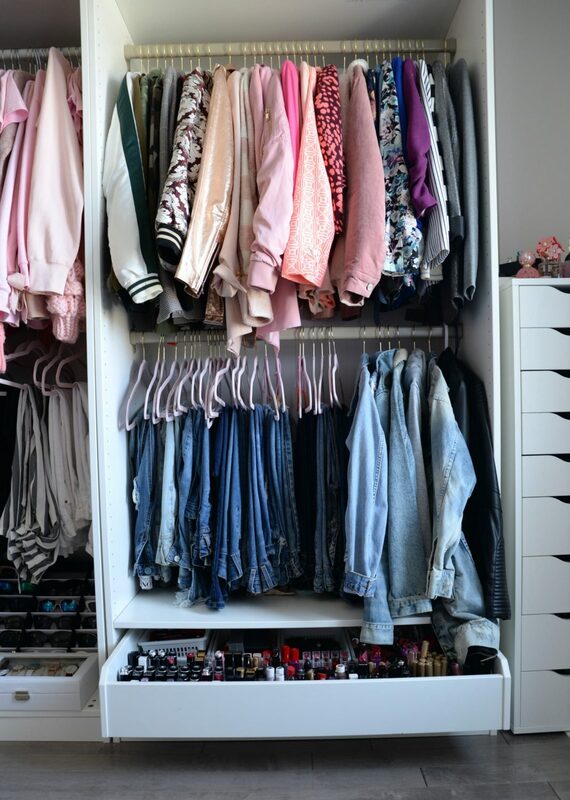 No two spaces are the same, everyone’s envision of their “dream closet” is different and we all have different budgets. When I first thought about changing our guest room into a walk-in closet/beauty room, I had a professional closet company come evaluate my space. They did all the measurements, came up with a game plan and then gave me a quote. I was shocked at how expensive built-ins and shelving could cost. I didn’t like the idea of it being permanent, meaning if we decided to move, I couldn’t bring it with me. I was left looking for other options. A few weeks later, I found myself at my local IKEA. A huge fan of the company, I know I’d be able to find a more affordable alternative than custom closets. Never in a million years did I expect to discover the PAX system, and instantly fall in love with it. 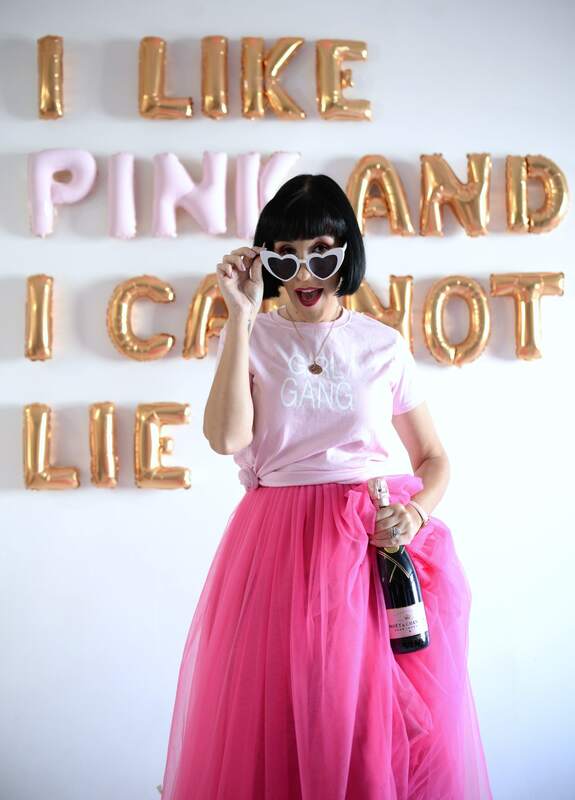 This was before Instagram and Pinterest days, where you couldn’t hop online to find inspiration, so I basically designed and created it myself. I also didn’t do much research on what a solid walk-in closet consists of. Although it served its purpose over these past 10 years, it’s time for an IKEA Pax Upgrade. 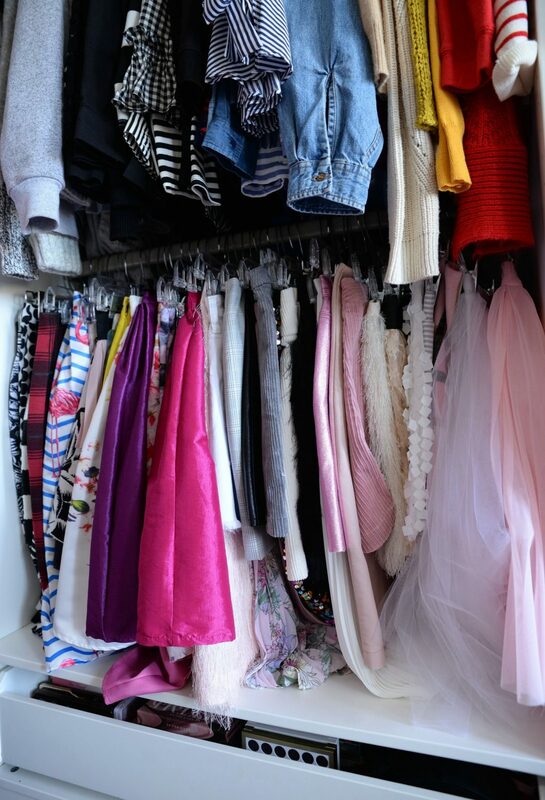 When building your dream closet, you want to utilize every inch. Although I currently have 3 PAX Wardrobe Frames, I only have the 201cm height, when my home allows me to have the 236cm ones. I highly recommend taking full advantage of your ceiling height and purchasing the tallest units you can. It wastes space if you don’t, and the one major disadvantage of my current units. I highly regret not getting the taller units and this is one of the main reasons I want to upgrade. I know now the key to having a well-functioning closet is to have options. 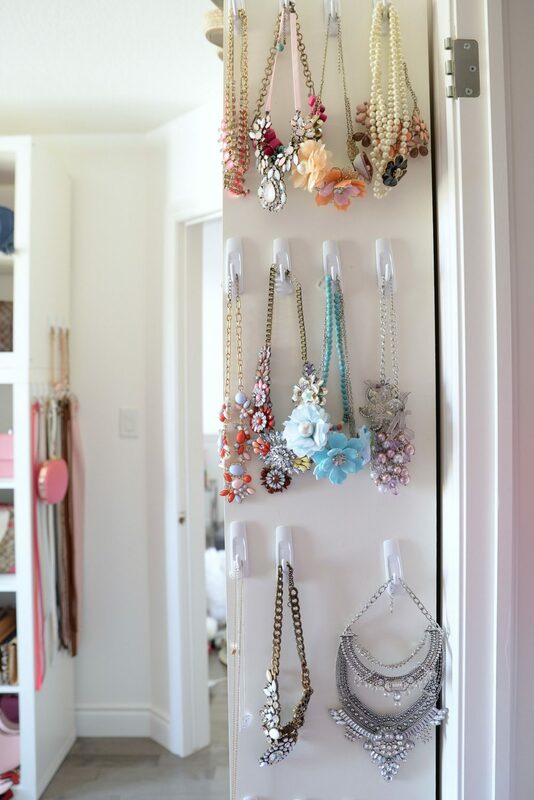 Having multiple hanging space, along with several drawers and shelving is key. 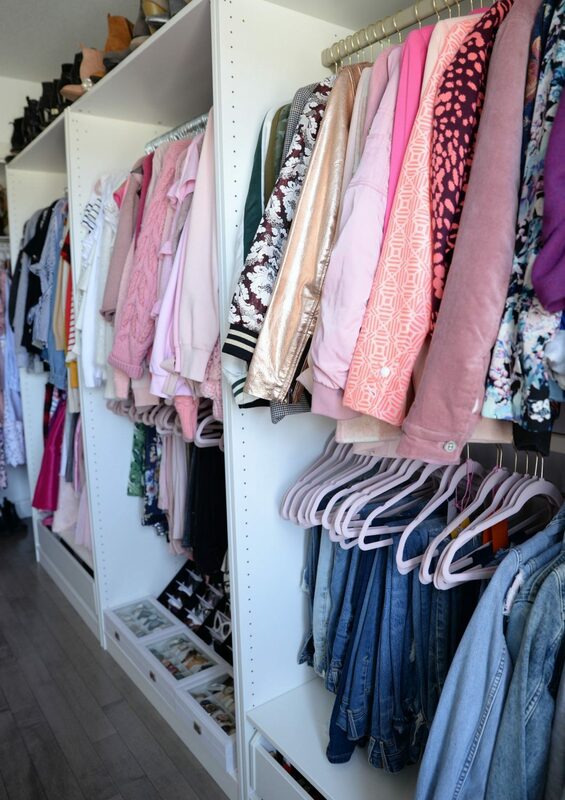 A well-designed walk-in closet is all about having designated hanging space for different clothing items, along with sections to store personal items. Again, my PAX Wardrobes only have a few rods for hanging my clothes, and a few bottom drawers for miscellaneous items. Although I feel I have plenty of hanging room, I’m limited to what I can place in drawers, since I only have two of them. 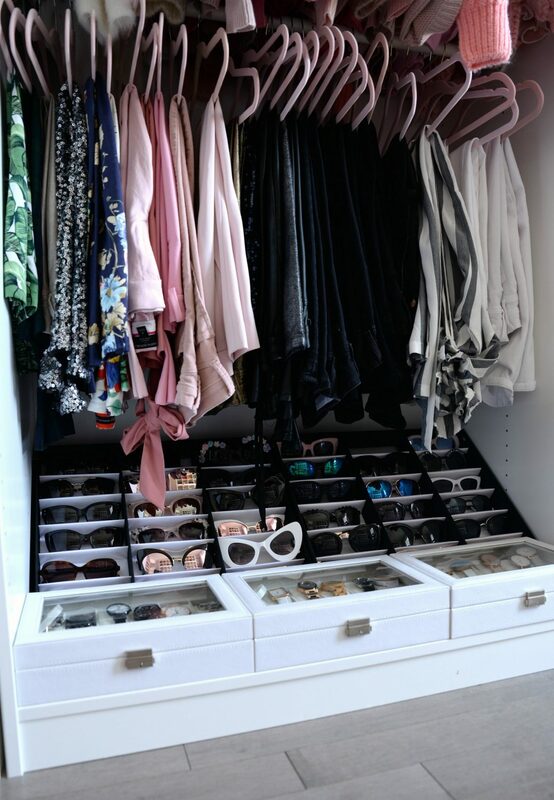 Take it from me, you can never have enough drawers for small personal items, undergarments, delicate sweaters that can’t be hung, jewellery, etc. This is another reason why I’m looking to upgrade. I want more storage space. We then come to the area of my closet where I’m still using the closet the home came with. While this has served its purpose over the years, it’s not really functional. I can only hold a few handbags on the top and dresses on the one rod. I also have placed some boots on the floor, which not only looks sloppy and out of place, it may end up damaging my hardwood overtime. It’s impractical, as I can hardly reach the one side of it, and it’s just an eyesore how it pushed back in comparison to the rest of the IKEA closet. I would love to get a corner unit, that can attach to both sides of the PAX system, creating the illusion of a built-in. I’m a shoeaholic. I have more than I’d like to admit, but I do have the one-in, one-out rule now. For every new pair I buy, I must toss, donate or give an old pair to a friend. I thought by using two of the IKEA Billy Bookcases to showcase my shoes, I’d never run out of space, but that didn’t hold up for too long. I still love the idea of having all my shoes together in one place, but it’s also very limiting. Basically, the only items I can place on these shelves are my shoes, which means it’s not very versatile for any other item in my closet. 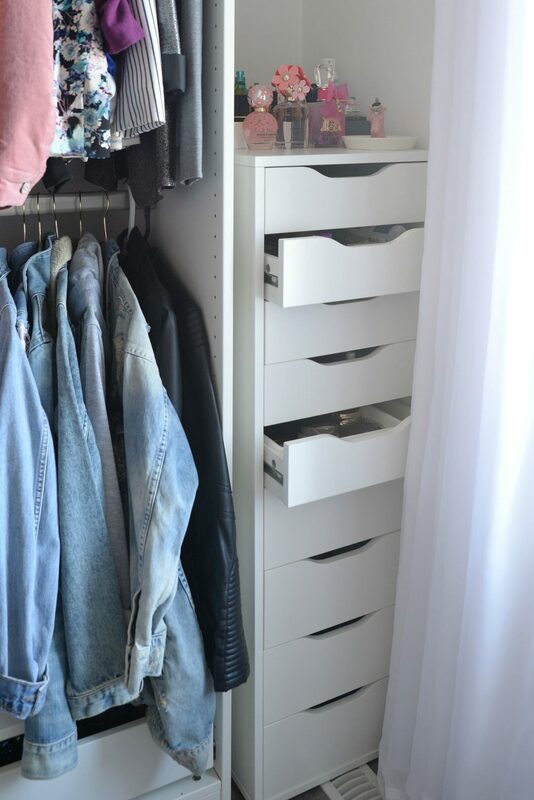 I would love to upgrade to another PAX Wardrobe Unit or two, allowing me the freedom to use shelves, drawers or roll-out trays to display my shoes. This also gives me the choice of adding or taking away pieces to fully customize it, outside of just shoes. We now come to my purses. Another addiction of mine (heck I used to run my own handbag company for over 8 years). I decided on the IKEA Kallax Shelf Units, in both the 16 cube one and the 8 cube one (placed on top of one another). It’s pleasantly appealing, but again, wasted space. Because they are so deep, I either have the option of placing one behind each other or stacking them. Either way, for the size of that wall, I feel like the PAX Wardrobe would serve the same purpose but allow me to have more creative options when showcasing my handbags. Since accessories are just as important as your clothes, you know I have a lot of them. The fact that I only have 2 drawers in my entire walk-in, means I’m limited on space. 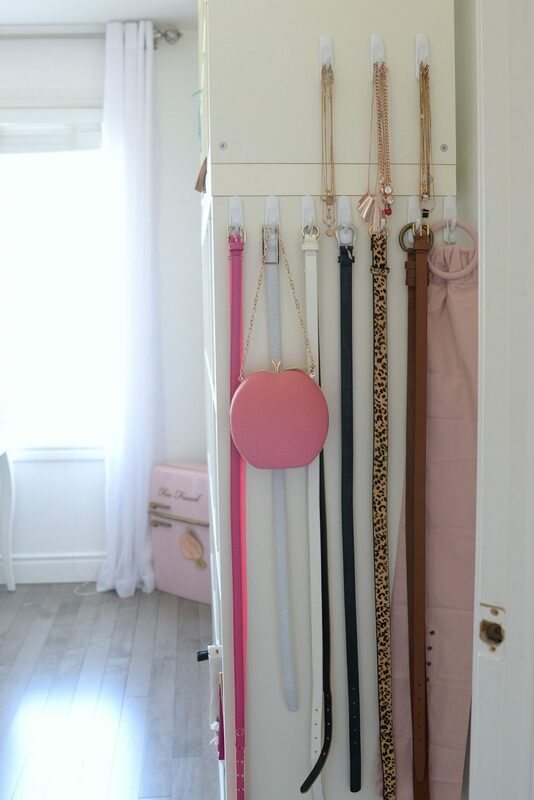 I would love to have a designated area to hang my belts, keep my sunglasses dust-free, and even have a few places to store my jewellery outside of hanging them on command hooks. 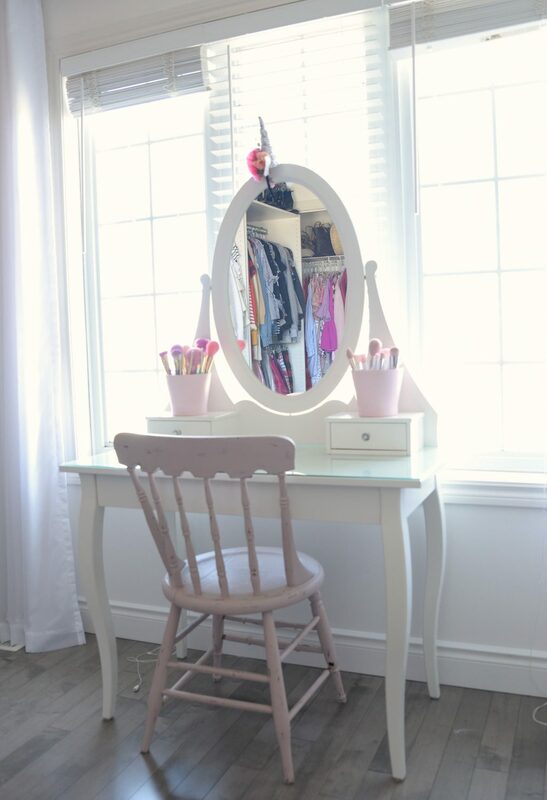 As far as where I get ready in the morning, I love my IKEA HEMNES Dressing table with mirror and wouldn’t change it. It sits right in front of my window, which means a ton of natural light. It holds all my every day makeup, and then I have the IKEA ALEX Drawer unit with 9 drawers to hold all my other makeup and cosmetics. This is the perfect setup for a beauty junkie like myself. After reading this, I just talked myself into a major IKEA PAX Upgrade. I’m excited to start the planning process. Key upgrades, taller PAX Wardrobe Units, more shelving, drawers and clothing rods. I wouldn’t mind some jewellery trays, a pull-out pant hanger, hooks for my belts, dividers for my accessories, and even some glass shelves to bring a more glam and boutique-style feel to my space. Another thing I’m looking to include is lighting. I went with a fancy chandelier, that although looks super chic and gorgeous, doesn’t provide a ton of light. It’s okay in the afternoon when I’m getting ready, but the mornings and evenings are a struggle.